Announcement Art / Paperie/collage/photography - Faune Yerby - hand made in Brooklyn, NY. Everything is MADE to ORDER so please allow 5-14 days for arrival . Please convo me if you need a piece quicker because I might already have it in stock. If you are in the NYC area come visit my POP UP shop with Artist & Fleas @ Chelsea Market on 10th Ave. and 15th St.
All items are shipped priority or first class mail. I will ship international andI can let you know the approx. cost. 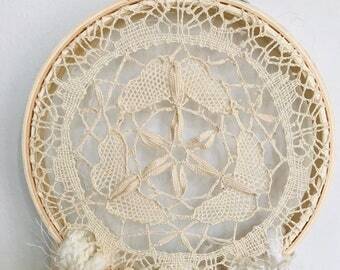 Please visit my other etsy store for hand spun yarn , textiles and supplies. Art / Paperie/collage/photography - Faune Yerby - hand made in Brooklyn, NY. Wall Art NYC -8x10 inch graffiti color photo collage of New York City original images . Wall Art NYC -8x10 inch Black & White photo collage of New York City original images . 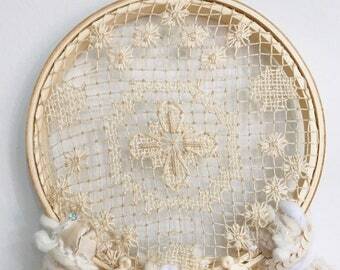 Boho Dreamcatcher/wall hanging - Lace Butterflies doilie with silk, wool ,cotton fringe with tassels. It's the third one I got, perfectly compliments my other two pieces of the Chrysler building and the Brooklyn bridge after rain storm which I had got from Chelsea market itself. Came to me in perfect condition. tools of the trade - my favorite scissors - I have alot. Studio filled with lots of jars filled with tools. I love tools. My grandmother Flora was a world traveler and collector. She and her family made one of the first around the world cruises after World War II. No wonder her son, my dad, traveled far to Thailand for his wife – and dragged us all around military family style. I’ve inherited Flora’s love of fashion and style, of beautiful things, of travel, of collecting. And having had such a nomadic childhood I really appreciate home and what makes it special. When you’re mobile, collecting photographs becomes one of the few obsessions you can take on the road. I love my camera, the darkroom, and messing with the image. Straight photography I could appreciate, but not love. I’ve tortured my negatives and prints over the years: scratching, burying them in earth, dipping them in chemical baths, stains, dyes. The methods have changed, I do some digital now as well, but the beautiful final image is still my goal – no matter what the medium for the photo. And often, through collage, the photo becomes a way to share a window on my obsessive collecting. A friend who once had the sweetest bakery in an old railroad car, made a delicious red velvet cake for my birthday, and, as an afterthought, gave me a little bag of plastic animals to decorate it. I put them in my pocket and forget them until one day I found them and saw – the little critters had tons of personality! The rest, as they say, is history. Along with my favorite watertowers, cars, NY architecture, my menagerie works on paper and canvas have quickly become popular favorites. Less mobile now I’ve grown fond of domestic pleasures. I garden on my Brooklyn roof, make art there in the summer, and it’s where I also wash, dye, card and spin yarn. If I could, I’d keep a mini flock of miniature goats and sheep there too! What a sight that would be for tourists walking across the Brooklyn Bridge. My home is a nest and a laboratory – where even I am surprised sometimes by what I cook up. I received my BFA San Francisco Art Institute and MFA Mason Gross School of Art Rutgers University. My work has been sold in MAD, Barneys NY, Anthropologie, Cog & Pearl, Tilde, By Brooklyn,Trunk and featured in Seventeen,House Beautiful,Time Out NY. Printify prints my original photographs on well made finished home goods and accessories. Please pay for all items within 7 days of transaction. Please use paypal for all payments.